The northern lights – a.k.a. 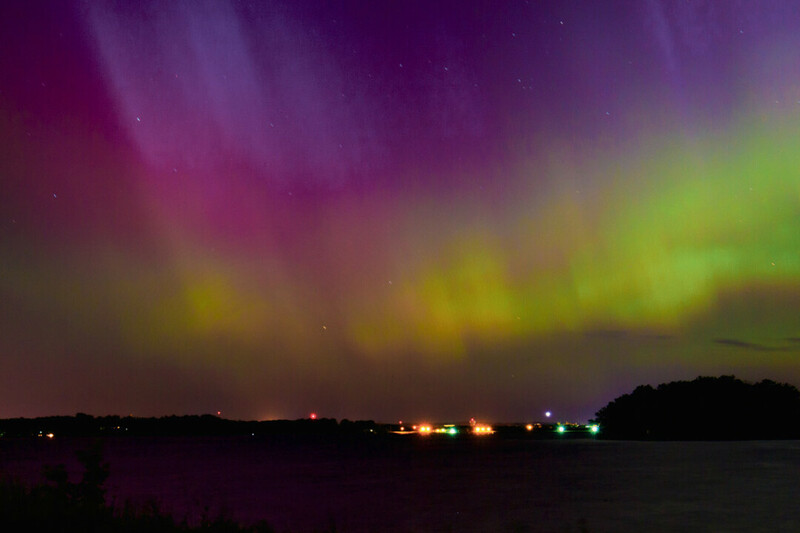 the aurora borealis – were visible over Lake Wissota late one June night. I never thought I’d find myself sitting alone on the southern shore of Lake Wissota at 2 in the morning with a camera – affixed atop a tripod – pointed skyward. But there I was, a few weeks ago, trying to make a permanent portrayal of the famously ephemeral aurora borealis. Like many in western Wisconsin, I was giddy with excitement that the northern lights were visiting us here with such vibrancy, so far from their typical range. But my goal on that particular evening wasn’t merely to see the lights, but to record them in a way that spoke to me, and perhaps others, long after they had retreated back to the arctic. Growing up in a now defunct taconite mining town in northeastern Minnesota, where “the auroras” are a more commonly-seen spectacle, I wasn’t exposed to much in the way of “art.” Nor was I all that eager to seek it out. I did, however, grow up in a time – seemingly long gone – when art classes were a staple of the primary school core curriculum. So I should clarify that some art was forced upon me at an early age. In high school I did sketch a pretty cool Coca-Cola can – in charcoal. Before that I drew an amazingly adrenalized Def Leppard logo – using crayon – that was ultimately ironed onto a white Fruit-of-the-Loom T-shirt. Oh, and I did play the trombone in the middle-school band. So, upon further reflection, I was probably about as artsy as a kid from the Iron Range could be. I have resided in the Chippewa Valley for 11 years now and it only recently dawned on me that I am surrounded by amazing art and artists. It took me a while to notice (and even longer to appreciate), but I am reminded daily that I live in a place that exudes inspiration and cultural stimulation. And exposure to this abundance of creativity has proven contagious. Because I teach at UW-Eau Claire, I work alongside lowly state employees just like me who publish, perform, paint, or otherwise produce various forms of art every single day. Why not me? Prolific coworkers and neighbors have inspired me to try things I never would have considered only a handful of years ago. For example, last winter I told a story to a small crowd at an open mic event. Earlier this summer I delivered a spoken word poem in front of a couple of hundred people at a friend’s wedding. It is true that I regularly speak in front of audiences large and small as a function of my job, but public storytelling and poetry slamming were both firsts for me. I’ve also been moved to write more creatively. As with public speaking, I am not new to writing. In fact, prior to being introduced to the work of a few local writers, I had actually written more books than I had voluntarily read from cover to cover. But these were also related to my job and mostly produced for particular audiences. Lately I’ve been inspired to flex my burgeoning belletristic biceps and our community has all of the supports a blossoming dramatist needs. Because even though I spent over eight years in higher education, I somehow managed to avoid taking a single writing course. I did meet my future wife in a literature class at UW-Superior. Suffice it to say I spent more time studying her than Chaucer. There is still much to be learned. And while I’ve always been interested in photography, it wasn’t until last fall that I finally broke down and bought an entry-level DSLR camera. I loved it so much that after just a few weeks I had to have an even better (read: more expensive) model. And what good is a decent camera without a legion of lenses? I dove head-first into the medium, reading online articles and watching many hours of YouTube photography videos. I’ve connected with a few local photographers, and I am loving this new means of expression. On that warm and windy summer night a few weeks ago when many residents of western Wisconsin found themselves sleep-deprived and with sore necks, I was practicing my newfound artistic outlet. It turns out that taking good photos, especially in the middle of the night, is more difficult than I thought. Most of my shots didn’t turn out the way I envisioned. I fumbled with finding just the right camera settings and only after much experimentation did I finally manage to capture a few keepers. In trying my hand at various art forms, I’ve come to learn that one of the defining characteristics of someone who does something, any thing, really well, is that they do it in a way that makes it look easy. And here in the Chippewa Valley, we are blessed with an abundance of virtuosos. To the uninitiated onlooker, their art is effortless and therefore anyone should be capable of doing it. Whether it is playing the piano or painting a portrait, some people are truly gifted. But very rarely do those gifts manifest themselves as masterpieces without years of hard (and often hidden) work. We see and hear the beautiful fruits of this labor and yet forget about the time of toil in the proverbial (and sometimes literal) fields. Thankfully there are plenty of opportunities in our own backyard for budding artisans like me to put our creations out there to be consumed, critiqued, and corrected. Telling stories to strangers or publishing pictures in public are paths to creative contemplation and augmentation. And like the northern lights, in the universe of things, life too is fleeting. My newly acquired interest in storytelling and photography also likely stems from a mounting desire to preserve those experiences that without proper documentation would be lost to history forever. Fatherhood and approaching middle age might also be the impetus for some of this initiative. The Minnesota mining town in which I was raised is undergoing a revival of sorts. New businesses are moving in and the population has stabilized. I hope subsequent generations there, and here, are introduced to art in a way that cultivates a latent curiosity that blossoms beautifully, even if it occurs much later in life, as it did with me. I want to encourage you, fine consumer of my art, to get out of your comfort zone and experience some of this community’s creativity in a way that arouses something in you. Who knows, maybe you will write the next best-selling novel or Grammy-winning song. Or inspire a neighbor to spend a night taking snapshots under the stars.